Gramercy Guy and I have been married for just over a year now and we still enjoy a formal date night. Date night is planned in advance, as opposed to checking Opentable at 6:30 on a Saturday night. We had a blast. For those of you following me on twitter, you know we had a very full night. Went to Tipsy Parson and was lucky to snag some seats at the bar. I had a glass of persecco and I love that they serve it in a coupe (the old style bowl like glass) as opposed to a modern day flute. Gramercy Guy had a Tipsy Palmer, which is the alcoholic take on an Arnold Palmer. ½ lemonade, ½ sweet tea bourbon, with a sprig of mint. This winner will make it to the cocktail list when BBQ season rolls around. Cheers! R: Can you hold on a second? Isn't that what I asked for when I called? Dinner was delicious and I highly recommend it to everyone. Salina has been well reviewed, 2 stars from the New York Times and Esquire named it one of the best new restaurants of 2011. I completely agree with all the accolades. This was a great cocktail with beet puree, lemon juice and gin. It was very refreshing and reminded me of the #5 drink of my cleanse (those you’ll learn about in March). 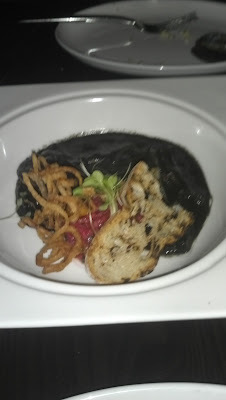 Calamari braised in its ink, served with a few crispy fried onions and a piece of toast (this was a special). It might look like a bowl of Dead Sea mud, but I assure you it was tasty. 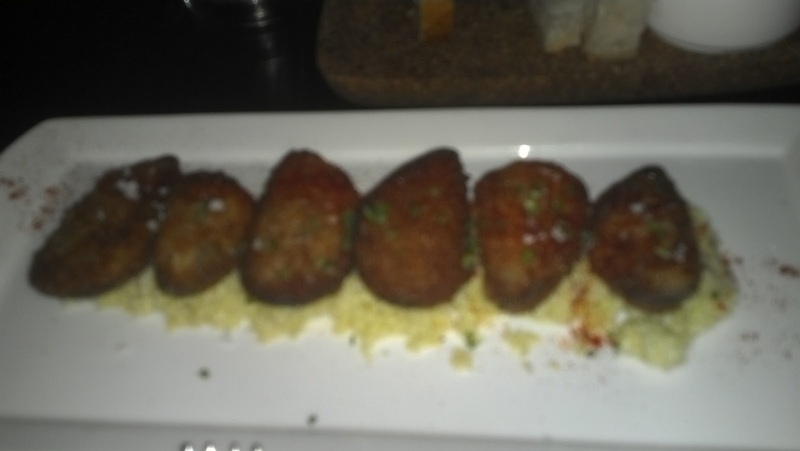 Mussel Croquets. This is more like a clam’s casino but with mussels. 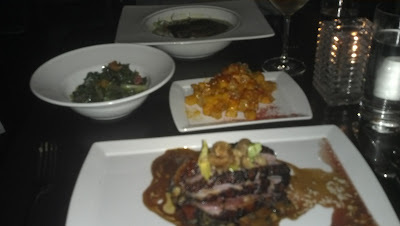 Gramercy Guy had the special which was a Spanish take on duck l’orange and it was really really good. I had the Bacalao (salt cod) from the menu. Patata Bravas which are a MUST HAVE…crispy potato chunks in a spicy sauce with just a hint of sweet. We over ordered, for sure, we always do. The service was great, not to pushy, very knowledgeable and our meal perfectly paced. I didn’t feel rushed at all which was amazing because there was a huge line waiting for tables when we left. Date night couldn’t end without dessert so we headed next door to Bathtub Gin. For those of you not in the ‘know’ Bathtub Gin is a speakeasy behind the false wall of the Stone Street Coffee Company. The red light and the big bouncer are your clues. We ordered the s’mores and out comes a flaming cauldron and your perfect s’more staples, graham crackers, Hershey’s chocolate bar and marshmallows. I like to let my mallow catch fire and I put it out by squeezing it between the graham and chocolate. To pair our dessert, Brandeon Bogard the bar tender made Gramercy Guy and off the menu drink which was egg , chocolate and gin. Branden made me the Carol Channing which was the perfect fruity balance to the sugar from the s’more. If do go the Bathtub Gin, ask for Brandon and tell him Gramercy Girl sent you. All in all it was a perfect date night and I can’t wait until the next one.